INJAZ Bahrain organized an educators’ day, which took a place on February 11th 2016, at Bapco club in recognition of the on-going collaboration with the Ministry of Education. The event honoured educators, Ministry of Education officials and school coordinators who are actively involved in the organization’s programs. In presence of Sh. Hessa Bint Khalifa Al-Khalifa, the Executive Director of INJAZ Bahrain, Ms. Latifa Al-Bunodha, Undersecretary for General and Technical Education, Private Directorate and other VIP officials at the Ministry of Education. Certificates of appreciation were distributed to all participating school coordinators for their efforts and valuable contributions over the 2014-2015 academic year. Trophies were also handed out to the Best Schools for 2014-2015 and to the Ministry of Education for their lasting support in implementing INJAZ Bahrain programs. The event started with a welcoming speech by Sh. Hessa Bint Khalifa AlKhalifa in which she commended the Ministry of Education for embracing INJAZ Bahrain’s mission since its inception and thanked all Ministry of Education officials, schools officials and teachers for all their efforts to support INJAZ Bahrain to inspire and prepare the Bahraini youth to succeed in the global economy. 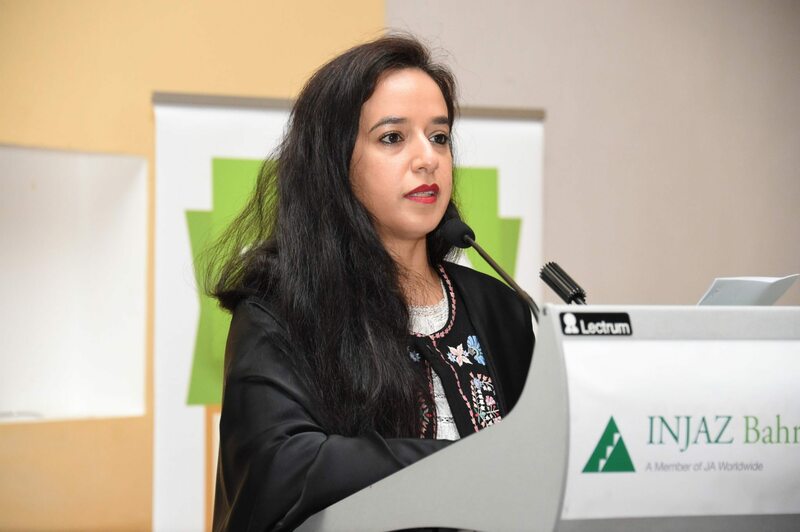 Mrs Latifa Al-Bunodha also addressed the audience by thanking INJAZ Bahrain for offering students the opportunity to learn about the global economy, acquire the work-readiness skills, know-how to be successful in the workplace and be exposed to the real work environment through the mentorship, internship opportunities and programs offered by the organization in partnership with the private sector entities to enrich the students’ learning experience. INJAZ Bahrain is a non-profit organization which aims to inspire and prepare young Bahrainis to succeed in a global economy.